A favorite Key Largo waterfront restaurant and tiki bar Snapper's first opened it’s doors overlooking the Atlantic Ocean in Key Largo in May of 1989. It’s unique old Florida atmosphere and Caribbean style seafood immediately helped it gain notoriety throughout the Florida Keys and beyond. The view from our Tiki bar, restaurant, or deck overlooking the marina speaks for itself. The building has survived hurricanes, floods, and pillaging by pirates and it’s rumored that the upstairs was once a house of ill repute. All the history, plus the unique coral architecture have helped to develop its character. Snapper's Restaurant offers quality dining with a Florida Keys feel at moderate prices in a casual atmosphere. Both locals and visitors alike are treated to a truly enjoyable Keys experience when visiting Snappers. Whether you’re enjoying our Jazz Brunch on a Sunday morning, dining by the waterfront for lunch or dinner, seated inside our cozy dining room, or sipping a tropical cocktail at our Tiki Bar or our famous Turtle Club- You’ll see why Snapper’s Waterfront Restaurant & Bar is receiving accolades as the area’s distinctive Florida Key’s dining experience. Snapper’s is located at Mile Marker 94.5, Oceanside, in beautiful Key Largo, Florida. Daily Keys favorites such as Yellowtail Snapper, Stone Crab Claws, and Florida Lobster Tail are always available. Our hours of operation include: Monday-Thursday: Lunch - 11am to 5pm / Dinner-5pm to 10pm Friday and Saturday: Lunch-11am-5pm / Dinner - 5pm to 11pm Sundays: Brunch - 10am to 2pm / Lunch - 10am-5pm / Dinner - 5pm to 10pm Although reservations are not required they are recommended especially for parties of 6 or more people. You can reach us at (305) 852-5956 or at our email address snappers139@hotmail.com. Snappers Waterfront Saloon and Restaurant, home of the famous Turtle Club (a locals' favorite) with live entertainment. 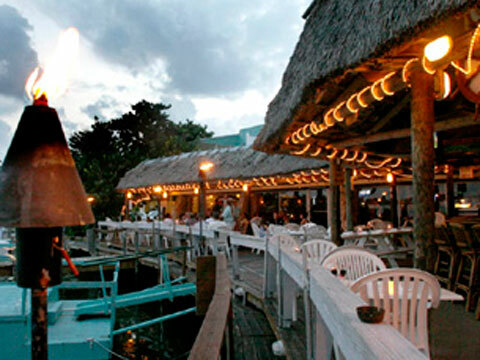 Snappers features one of Key Largo's best waterfront dining experiences. Our seafood is so fresh we print menu inserts each day because we don't know what's coming to the dock. And all our fish is filleted on the premises. Our sauces are made from scratch daily as are our chowders.